I love this project. There are endless possibilities with it. Ellen I just want to say thank you for the copics. My wonderful husband bought them for me during your sale as a christmas present. What did I get myself into. Practice. Practice. I guess. By the way you have been tagged. This is such a beautiful ensemble!! Great kit, Michelle -- SOOO adorable!! I love the bright colors and what a wonderful idea Ellen has to send off recipes with a child that's leaving the house! I hate to even start thinking of that time that will come too soon, I'm sure! 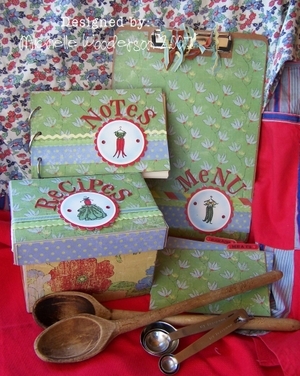 what a fabulous recipe set and how clever to use the veggie stamps! I love this! Michelle did a wonderful job and you certainly gave me food for thought- teeheehee- to make one for each of my DD!! !